A nice little something for you. Not letting the cat out of the bag. Enjoy this. Ismaili: 21-Mohamed Sobhi, 4-Emad Al Nahhas, 6-Islam El Shater, 27-Moatasim Salem, 3-Amr Fahim, 14-Sayed Moawad, 24-Ahmed Fathi, 13-Mohamed Hommous, 12-Hosni Abd Rabbou, 18-Mohamed Mohsen Abougreisha, 19-Dramane Traore. Enyimba: 1-Vincent Enyeama, 3-Obinna Nwaneri, 6-Ajibade Omolade, 24-Ugah Okpara, 19-Seyi Ogunsanya, 7-Yusuf Mohammed, 23-Abubakar Musa, 28-Muri Ogunbiyi, 30-Ekene Ezenwa, 26-Onyekachi Okonkwo, 18-Michael Ochei. 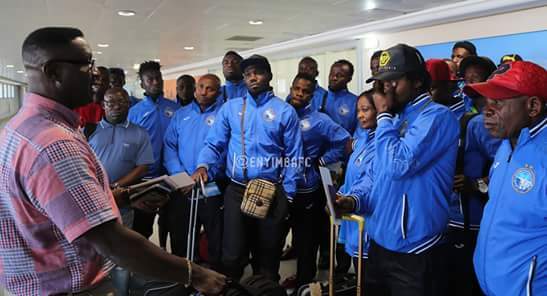 Enyimba’s preparations for the match in Ismailia have been overshadowed by concerns about their treatment in Egypt. Chairman Felix Agwu has complained about the standard or the team hotel and the fact that the side has not been able to train leading up to the match. “The hotel is the cheapest I have ever seen, I am not happy about it and neither is my team,” he said. 1700 GMT: The Champions League final gets underway with a tense atmosphere at a packed Ismailia stadium. 1703 GMT: Mohamed Hommous dives in the penalty area in search of a spot kick for Ismailia but Seychelles referee Eddy Maillett is not fooled and waves away half-hearted protests from the Egyptians. 1706 GMT: Enyimba goalkeeper Vincent Enyeama is cluttered in his own penalty area as he goes out to thwart Ismaili in a messy goalmouth scramble. The Nigerian keeper needs treatment. 1710 GMT: Enyimba’s first real chance as they burst into the area down the right wing but the home team defence is equal to the challenge. 1712 GMT: Ajibade Omolade claims to have been elbowed by an Ismaili player but the referee turns down his protests and awards the hosts a corner which is wasted. 1715: First caution of the game for Michael Ochei for ‘simulation’ as he seeks to win a free kick with a dive on the edge of the Egyptian side’s penalty area. 1717: Muri Ogubiyi, Enyimba’s Benin international, gets a yellow card for a rash challenge on Amr Fahim in what seems a lenient decision by the referee. 1719: Defender Amr Fahim has his header from a corner easily saved by Enyimba’s goalkeeper Vincent Enyeama. Fahim’s effort was impeded by his own teammate, Mohamed Mohsen Abougreisha. 1721: Great chance for Ismaili as Fahim hooks his foot around a corner from Sayed Moawad, but the shot goes wide of the goal with the Enyimba defence well beaten. 1724: Penalty for Ismaili after Abougreisha is brought down in the box after a challenge by the Enyimba defender Ugah Okpara. It looks a tough decision but Okpara might have got his timing wrong. The furious Nigerian players encircle the referee as the game is held up for two minutes. Even Enyimba coach Kadiri Ikhana has to come onto the pitch to calm down his players. 1732: Free kick for Enyimba just outside Ismaili¿s penalty area is wasted by Ajibade Omolade, who hits straight at the wall. 1738: Ekene Ezenwa runs into the danger zone at some space, spreading the Ismaili defence but his square ball across the face of goal fails to find a teammate. The match has become a dour midfield tussle but the shocking tackles from Enyimba, and to a lesser extent Ismaili, continue with no action from the referee. 1743: Ismaili’s Abd Rabbou shoots wide of the target from the edge of the penalty area after being set up by a pass from Mohamed Hommos. 1748: Ahmed Fathi shots wide off the goal after being set by Ismaili’s Malian import Dramane Traore as the home side seek an aggregate equaliser before the half-time break. 1745: Five minutes of stoppage time is signaled by the fourth official. 1806: Omolade is booked for time wasting as he dithers over a throw-in at the half-way line. There have now been four cautions for Enyimba and one for the Egyptians. 1805: The second half is underway in Ismaili. 1815: Nigerian goalkeeper Enyeama miscues an attempt to clear the ball from a back pass by Okpara, setting up a corner for Ismaili which sees Enyimba then clear the ball off the line in a wild scramble. 1816: Ahmed Garba cokes on as a substitute for Muri Ogunbiyi. Garba is a Nigerian international who Enyimba registered at the start of the year but who actually plays for another club. 1819: Enyimba goalkeeper’s Enyeama drops the ball from a cross but gathers it at the second attempt. His goalkeeping is becoming more erratic. 1823: Vincent Enyeama is at full stretch to stop a shot from Moatasim Salem, whose short from the edge of the area takes a wicked deflection. 1826: Wave after wave of attack from Ismaili but the finishing touches are not there as the Egyptians begin to squeeze the pressure on a brittle Enyimba defence. 1830: A rare attack for Enyimba but Michael Ochei is forced wide by the Ismaili defenders and the effort comes to nothing. 1831: Ismaili’s Malian striker Dramane Traore takes a long range shot from outside the area and gets a corner kick after Enyeama unnecessarily touches it, even though the ball is going wide. Fortunately for Enyimba, the set piece fails to set up the equaliser that the Egyptians are now desperately looking for. 1834: Ugah Okpara concedes a free kick on the edge of the Enyimba area after a dangerous challenge on Ismaili’s Mohamed Mohsen Abougreisha. Diabate bangs his shot through the wall but Enyeama dives to stop it on the line. 1836: Mohamed Abdallah is the second substitute of the night for the home side, coming on the right wing in place of defender Moatasim Salem. 1838: Traore is injured after his shot is blocked by the tight Enyimba defence. The Nigerians take off striker Michael Ochei and replace him with Emeka Nwanna. Then there is a stray punch and the two sides get involved in an unnecessary brawl. 1843: The game restarts after a lengthy delay as both teams send player after player to protest to the referee, who looks overwhelmed by the consistent complaints but eventually the game gets going again. 1847: Diabate’s shot from the edge of the area is blocked after a succession of passing on the edge of the Enyimba penalty area by the Ismaili players, now desperately pushing forward in search of the aggregate equaliser. 1849: Ismaili’s last throw of the dice as they bring on Hamam Ibrahim for defender Amr Fahim. Emad Al Nahhas catches Enyimba goalkeeper Enyeama with a stray elbow, setting off a furry of unnecessary protests from the Nigerians. 1851: Five minutes of stoppage time is shown again but the Egyptians are now getting desperate and losing their tempers, the tension in the stadium has now reached boiling point. 1854: Fighting erupts as Ismaili hit out at Ekene Ezenwa as he takes too much time to leave the pitch as he is replaced by Ndidi Anumnu. Missiles rain onto the pitch and another brawl ensues. Egyptian television then cuts the sound and after a minute the pitch as well, to cover up the embarrassment of an unacceptable performance by the Egyptians. The game looks to have been halted momentarily to calm down tempers. 1858: Referee Maillet has stopped the game to calm down tempers in what is the only solution to needless tackles, punches and brawling between the two teams. He is taking his time to get matters re started. 1900: The game is restarted and the referee seems to indicate that there will be five minutes more. Hopefully tempers have now been calmed. 1902: Ismaili cannot get through a resolute Enyimba defence as the match passes 10 minutes of stoppage time. 1904: It is all over as Enyimba are the first Nigerians to win the Champions League. There are furious celebrations for the guests but the home players burst into tears. Copyright: Property of the BBC. Previous postGuest Post: Enyimba’s unseen advantage 2. Next postIn Tunisia as the big game looms. where on earth is Ekene Ezenwa and Ndidi ?